Jasper (aka “Twin Ceder Jasper”) is a one of a kind draft horse. He is a rare registered Suffolk Punch horse. There are only between 800 and 1200 Suffolk Punches in North America today which makes it a rare breed. Like all Suffolk Punches he is a deep red color called sorrel. Jasper was born in 1992 and is 21 years old. 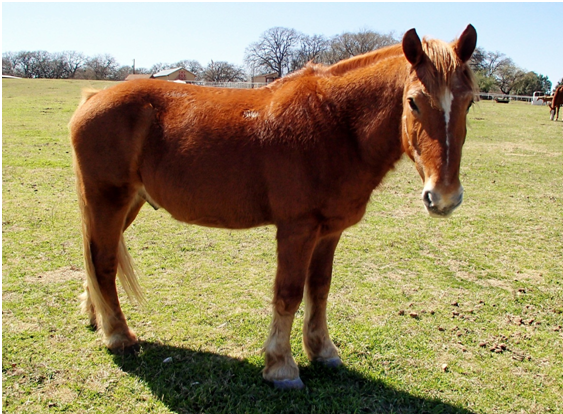 He is one of our three draft horses and is very important to our therapy program. Draft horses like Jasper are built strong and sturdy and were bred to pull wagons and plow fields for farmers. Because of his size and strength Jasper is perfect for our larger riders. Jasper is one of our two draft horses who are trained to pull a wagon. Back in his younger days Jasper pulled the Rocky Top wagon with our other draft horse Babe, in parades and other events. Jasper has been with the Rocky Top family for 12 years now and has carried numerous disabled people. Outside of his job Jasper hangs out with his buddy Happy Jack in the pasture.